Everybody, who grew up in USSR, has very special attitude to revolution, which occured in Russia on 7, November, 1917. Soviet propaganda was calling this event as «The most significant event of Russian history», and this statement isn't disproved even by those, who considers the revolution as unambiguously negative occurence. Its official soviet name - «Velikaya Oktyabrskaya sotsyialisticheskaya revolutsiya» («The Great October Socialistic Revolution»), but there are some other names: «Oktyabrskaya revolyutsiya» («October revolution»), «Velikiy Oktyabr» («The Great October») and even simply «Oktyabr» («October», necessarily with leading capital letter). More on that, if the word «revolutsiya» («revolution») was used without any specification then for sure it meant The Revolution. By the way, don't be confused, why it was called «October revolution», when it occured in November. Russia lately switched to modern Gregorian calendar and all dates in its pre-revolution history were behind by two weeks, in comparison to other world. So, in old russian system of chronology, The Revolution occured on 25 of October. 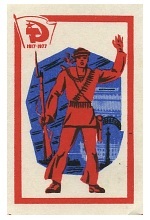 Revolution anniversaries were celebrating every year, and November, 7 was holiday. Especially magnificient celebrations were on revolution jubilees. 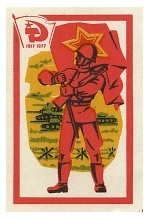 Labels, that are shown here were published in 1977, dated for 60th anniversary of revolution, and, despite their sketchiness, they completely show history of first 60 years of soviet commonwealth. Here is the moment of Revolution itself. Armed sailor in sailor's cap with fly away bands, stands against the background of «Zimniy dvorets» (Winter palace) and «Dvortsovaya ploschad» (Palace square) of Petrograd (before that Saint-Petersburg, then Leningrad, and now Saint-Petersburg again). Also, there's stormy sky and Avrora cruiser's main gun shot, which was the signal for start the assault of Zimniy. The meaning of this label isn't very clear to me. May be, we see peasant on German front (at the moment of revolution Russia was at war with Germany), which is about to take off his rifle, and return to his peaceful life. I'm wondering, what is pictured in the background. I suppose that my assumption about previous picture was right, because here we see the same peasant, holding his rifle in «peaceful» way, with barrel pointing to the ground. Obviously, he's not going to fight anymore. 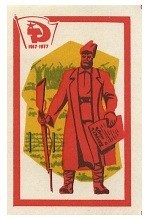 In his other hand there's «the Decree on Peace», first decree, published by Soviet power. Historical results of this decree were negotiations with Germany and making of Brest peace treaty. On the background there are soldiers, sincerely happy at ability to leave the entrenchments and return to their families. 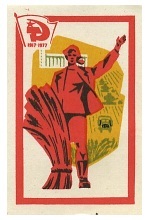 Next decree of soviet commonwealth was «The Decree on Land», which cancelled private property of land, confiscate land from large-scale land-holders, and given it to peasants in free use. At the same time, it forbidden waged labour usage. On this label there's the land surveyor, showing the text of this decree. On the background there's quite well-off farm and neatly tilled agricultural grounds. Peaceful life was not very long. In 1918, the country was plunged into civil war, that splitted the society to the red, who upheld the revolution, and the white, who wanted pre-revolutionary order to be restored. It was crucial time, because very often split was between near relations - the brother fought against the brother, and son against father. The main phase of war ended with the victory of the red on all European part of Russia with dislodge of the white from the Crimean peninsula in the late 1920. 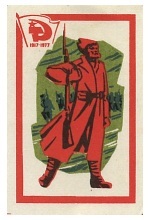 The complete victory was acheived in 1923, after neutralization of last resistance centers in distant places of Russia. 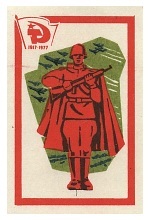 On this label, we see the soldier of the Red Army in typical regimentals for those times. Hats like this were called «Budyonovka», probably, in the name of cavalrymen of Budenniy (cavalry commander), who wore the same hats. By the way, there's the attacking cavalry on the background. After the end civil war, peaceful started to get right, and Russia, demolished by the wars, started the reconstruction of industry and economy. Worker, pictured on this label, rolls up his sleeves, to start the work with enthusiasm, which helped him in all hard times of all epochs. On the background there's Dneproges (hydroelectric power station on the Dnepr river) dum - biggest dam of USSR in that time, that was put in operation in 1932 - 4 years before Hoover Dam in USA. Arising soviet industry was requiring the metal. A lot of metal. Metallurgical plants were built throughout the country. 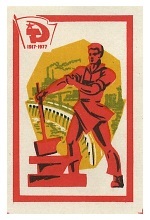 On this label we see steel maker - a man, who maintains blast-furnace. He holds the tap-out bar for making tap holes - openings for slag and cast iron tap. On the background there's a typical landscape for those times - the metallurgical plant with blast furnaces. 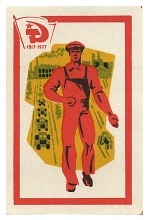 USSR's Industry development was including the appearing of new industries, such as motor-car construction and tractor-building. Transport system development, that's very important for economy, is impossible without cars. And tractors made ability to bring industry methods to agriculture, that became collective to that time. Peaceful evolution of USSR was interrupted with Germany's aggression, that invaded USSR territory on Sunday, 22, June, 1941, with massive bombing raids on boundary military objects and metropolises. 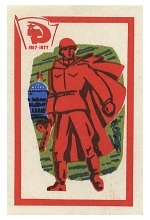 Soviet Union was engaged into World War II. 22 of June was Last Ring day in Soviet schools, when graduates celebrate receiving of the school-leaving certificate, and going spree all night long, and foretaste the beginning of an adult life. Many of them went to the war right from this party, and their life became too adult. 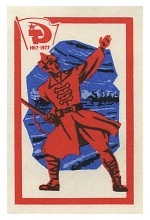 This label shows second phase of war, which was offensive for USSR. The soldier is armed with Shpagin's submachine-gun, and on the background there's T-34 tanks, the best tanks of WWII. They moving to to the west, chasing recessive German forces, and in the sky there are airplanes, which shapes have nothing common with any WWII aircraft, while picturing the shapes of IL-2 (the best attack plane of WWII) would be more correct. The war is always moves the science forward. After the war, Soviet army started to arm with new modern weapons, staying one of the most battle-worthy and technically equipped armies of the world. This allowed USSR to save military parity with another military-developed country - the USA. On this label there's a soldier, armed with most popular infantry weapon in the world - the Kalashnikov. In the sky, there are jets with shapes look like famous MiG-15, MiG-17 and MiG-17, that participated in air fights in Korea and Vietnam. The war ended, peaceful life began, and demolished economy started to recover. On this label, I think, the melioration (the irrigation of arid land) is shown. Acequias, sprinklers. Obviously, now it is highly industrialized. Ground is treated by tractors, according to plan. There always were a lot of woods in USSR, because of taiga, occupying the most part of Siberia. 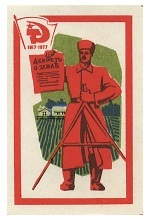 The timber industry was always the important source of income of soviet state, By the way, matches, their boxes and labels, are made of wood too. 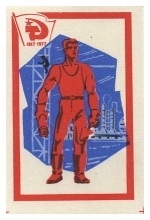 On this label the lumber-man is shown. 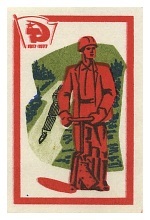 He is armed with classical soviet chainsaw «Druzhba» («Friendship»). On the background there's a wood float on one of the siberian rivers. 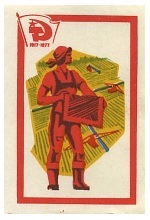 USSR's agricultural policy was always directed to joining and enlargement of farms for intensification and industrialization of farming production. 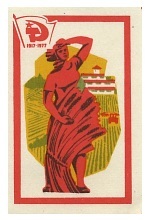 On this label we see huge barn-floor building (place for grain drying and storing), combine harvesters are gathering, and trucks are transporting. Of course, these means of production were unavailable for small family farms. Industry was actively developing too, including chemical. 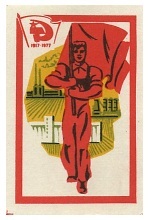 On the label we see some welded fabrication constructuion, numerous wires, representing energetical saturation of soviet industry, and the refinery on the horizon. The builder on the foreground is armed not only with trowel. In his other hand he holds the rolled up draft. This fact says us, that he can raise over simple executor of mechanical jobs, and implement a projects, stated in engineering language. Here we see signs of quite developed socialistic order. 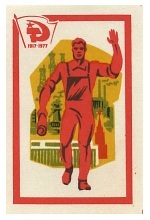 The worker, still with draft in his hand, showing, that everything in USSR is done intelligently, is shown on the background of Kremlin palace of congresses, Spasskaya tower of Moscow's Kremlin, blast-furnaces (despite crucible furnace were actively used at those times), big industrial plant (looking like heat station) and oil derricks. One more demonstration of maturity of soviet farm industry. Country woman with rye sheaf (by the way, manual sheaf binding was obsolete to that time, so it's unclear, where did she get it) stays on the background of neatly tilled fields, and there's a big cattle-breeding complex, behind them. Milkmaid on the foreground holds milking machine. Behind her, there are fields, pastures with cows and farm-yard. Power line says that all of these are, of course, electrified. Milking machine, of course, is electric too. Of course, this list is not complete. 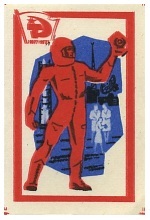 Therefore, it's very strange, that metallic pennant in cosmonaut's hand, very similar to those pennants, that were delivered to the Moon by soviet automatic stations, was chosen to illustrate soviet space achievements, while the US 6 times landed their astronauts to the Moon. There were a huge network of railway lines, most of them were electrified, but railway communication with Transbaikalia and the Far East was by single branch line, passing between Chinese bounds and the Baikal. Of course, it is irregularly, when such a important strategic railway passes so close to boundary with other state. So, the soviet government decided to build an alternative route to the north from Baikal. 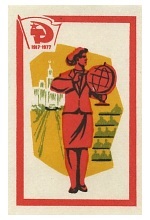 It was named the Baikal-Amur Mainline, or simply the BAM. 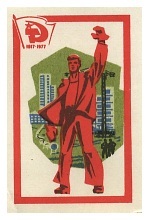 The BAM was declared as the Komsomol-youth construction, so, the surge of young workers was secured. The construction was being held from 1967, when real construction began, till 1989, when the first train passed through it. But it can be considered fully completed only from the moment of completion of north-Muisk tunnel - it happened in 2001, in the time of Putin. 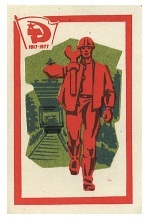 On this label we see the worker on the foreground, and the rail-laying train. Although the house-building was falling behind of population needs growth, it had very impressive speed. First considerable burst occured in the time of Khrushchev, who ordered to build cheap, many-porched five-storey with 2.5 meters (~6.5ft) room height instead of Stalin's pompous many-brick many-storey with 3.5m (~9.8ft) room hight with individial projects. This helped to take away burning issue of the lack of habitation. «Brezhnevka's» became the next step of house-building. Room height remained the same, but the flats became more spacious. Also, building of more warm and comfortable brick houses was started. On the label there's a building yard of Brezhnev's times. Of course, the development of science, industry and the society as a whole required an increase of education level. And it grew. Secondary education became usual for everybody, every student had a choice - to stay at secondary or vocational education, or continue studying at technical school, or university. On the label teacher woman is shown against the background of typical university amphitheatre-like auditorium and the building of Moscow State University. By the way, MSU - is one of the few institutes of higher education of modern Russia, diplomas of which are unconditionally accepted and highly regarded all over the world. To work and to study - that's good! It's very useful for the country. But taking some rest is very important too. In USSR there were numerous recreation centers, sanatoriums and resorts, so there was the choice. 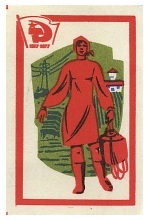 Soviet people traveled to vacations abroad very rarely, generally because of bureaucratic obstacles of a registration of departure. Adventure holidays were actively popularized. On the label we see a sample of such holidays. 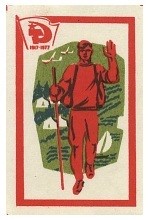 The hiker with rucksack walks against the background of the forest with campsite, yachts in the river and the gliders in the sky. Incidentally, everything of these was available without sensible investments, just a wish was definitive. And the last label, one of the most ideologized labels of this series. 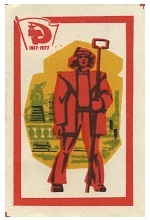 The worker proudly carries the Red Flag against the background of the attributes of socialistic economy - tilled lands, barn-floors, chemical plant, and a heat station or one more plant. I recalling the words of the famous soviet song «Chelovek shagaet kak khozyain neob'yatnoy Rodinyi svoyei» («Man walks like a master of his immense Fatherland»). All of this was, and everything leaved a trace of everybody, who catched this period of Russia's history. This trace is different, and today everybody appreciate it differently. It's normal. Russian people finally became different and free to think differently. And the one thing, they mustn't do - to forget everything that was in the past. Because there's no future without the past.